One of the great things about Star Wars is that it inspires endless debates and opinions on a wide array of topics. Best bounty hunter? Most powerful Jedi? Does Salacious Crumb have the best haircut in the saga? In that spirit, StarWars.com presents From a Certain Point of View: a series of point-counterpoints on some of the biggest — and most fun — Star Wars issues. 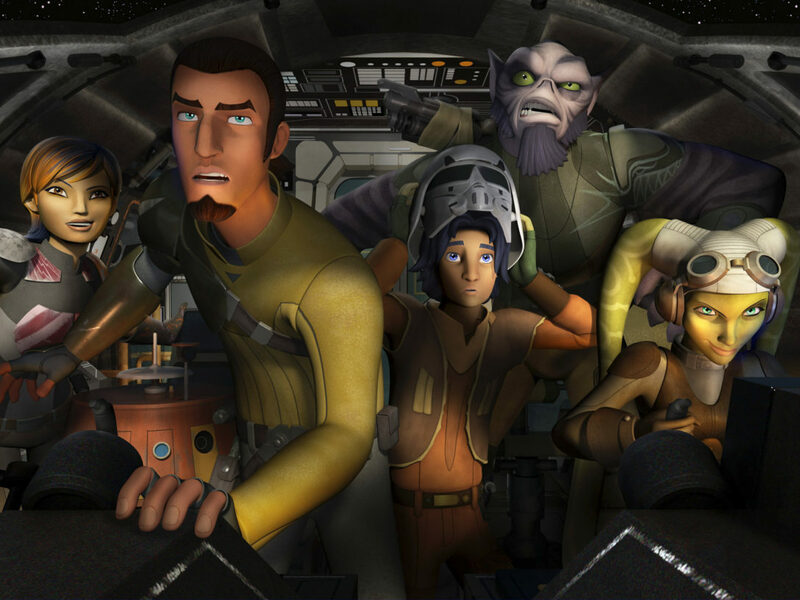 In this installment, two StarWars.com writers discuss which moment from the second season of Star Wars Rebels they deem greatest. Darth Vader’s first showdown against the Ghost crew in “The Siege of Lothal” is the best moment, says Meghan O’Keefe. I’m going to make a controversial call and declare that the best moment in Season Two of Star Wars Rebels was actually one of the earliest ones. Believe me, this was a tough decision. Sure, I loved it when Darth Maul creepily asked Ezra to call him “Old Master.” I kvelled when it was revealed that the Jedi Temple Guard testing Kanan was actually the Grand Inquisitor. 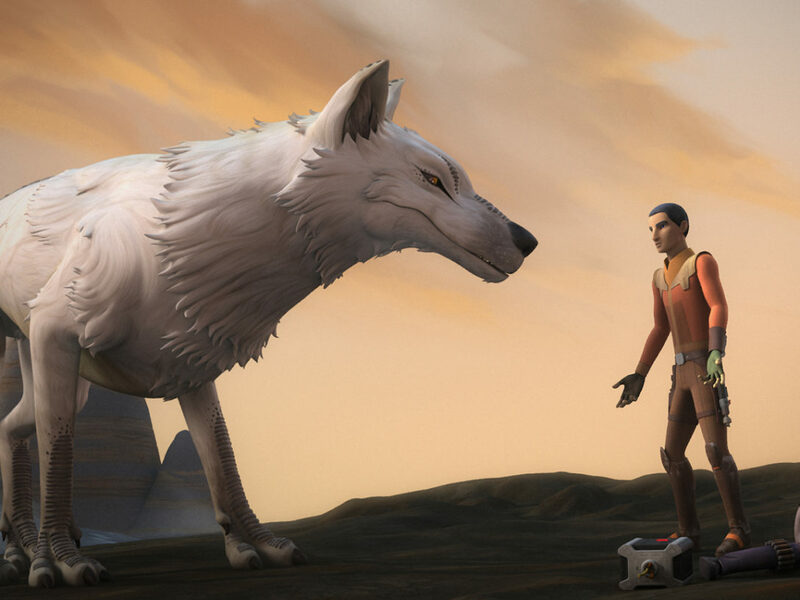 I even loved every time a Loth-cat scampered across the scene — seriously, can I get a Loth-cat? But when I think deeply about it, the defining scene of the season was Darth Vader’s first showdown against Ezra, Kanan, and the crew of the Ghost. Okay, it might seem like nothing compared to some future revelations, but when Vader ambushes the crew on their way off the planet, we see something only ever hinted at in the original trilogy. We see Darth Vader at his full strength as a relentless enforcer and he is terrifying. The Vader of the films was intimidating, but Vader here is a force of sheer dark side power. His power over the Force is at an all-time high, especially because he’s not distracted by his own torn feelings over Obi-Wan Kenobi, Ahsoka, or Luke. In short, he’s in full villain mode — and it’s delicious. He’s single-handedly dealing with an entire band of talented fighters and he’s more than a match. He’s a big bad of the highest order (no First Order pun intended). Darth Vader’s first appearance against the crew of the Ghost proved that he wasn’t going to be window-dressing. He wasn’t just showing up to be a nod to the fans. 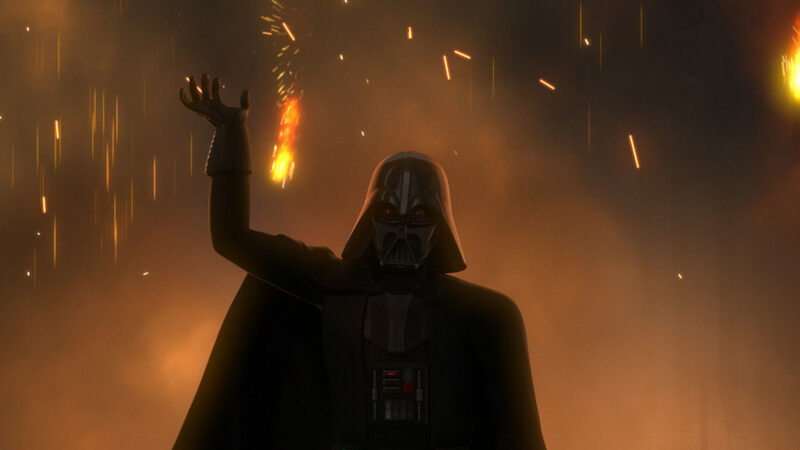 He was there to advance the plot, heighten the stakes, and unite Star Wars Rebels with the rest of the canon stories. So really, Vader’s first big appearance became a metaphor for the direction in which Star Wars Rebels was moving. 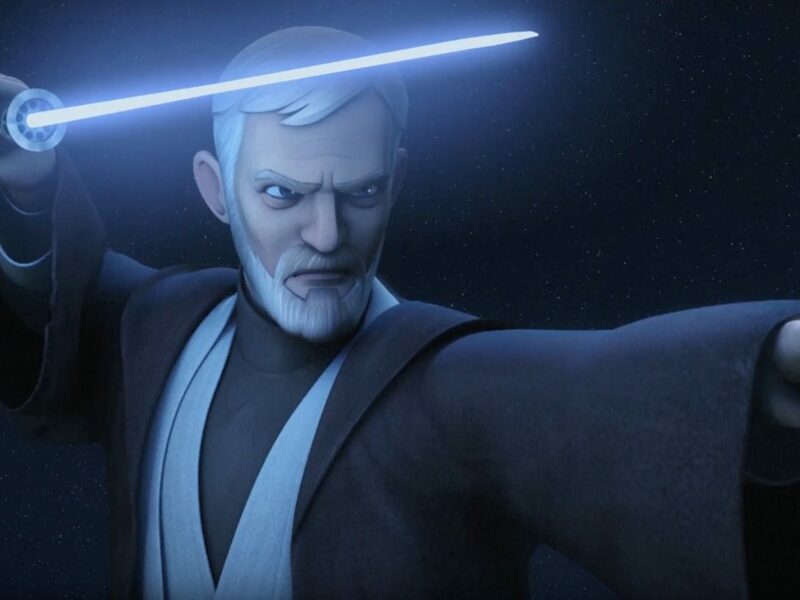 Season Two wouldn’t just present our heroes with new foes and challenges; Season Two would connect the sprawling Star Wars universe. It was going to pick up lost threads from the prequel trilogy and Star Wars: The Clone Wars all while deepening our understanding of the larger Star Wars galaxy. Kanan, Ezra, and the rest of the crew got to tussle with Vader as a sign of how important they were to the overarching saga. Vader’s first big fight is an expert piece of storytelling that raises the stakes, but it’s also a beautiful bit of fan service. Usually that phrase is used as a knock against something, but I mean it as a compliment here. It’s difficult to convey the rush of sheer joy I got watching Darth Vader at the apex of his powers, except you should know that I started rocking back and forth and screeching in my living room. In my defense, it was such a powerful and wonderful moment for a Star Wars fan to see! It felt like we were finally getting to see a myth in motion. Isn’t that why we love Star Wars in the first place? It’s a mythology that lives and breathes in our own time, and one that isn’t confined to dusty pages. If I’m being honest, that’s why I really why I love this scene: It’s a legend come true. 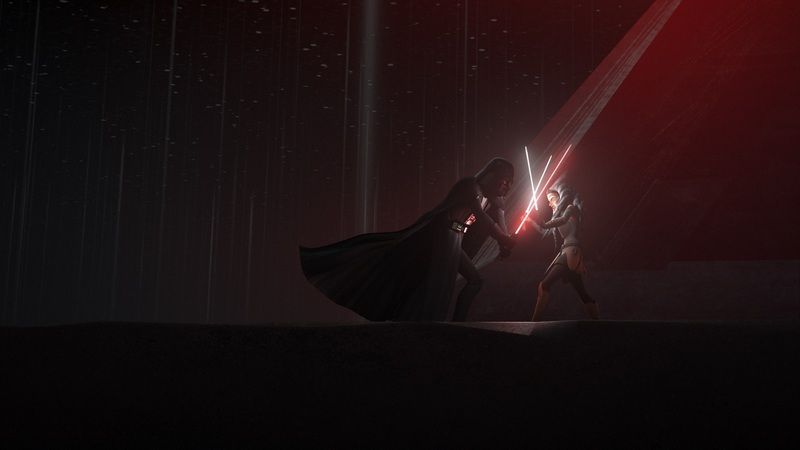 Ahsoka Tano’s duel with Darth Vader in “Twilight of the Apprentice” is the best moment, says Geek Girl Diva. 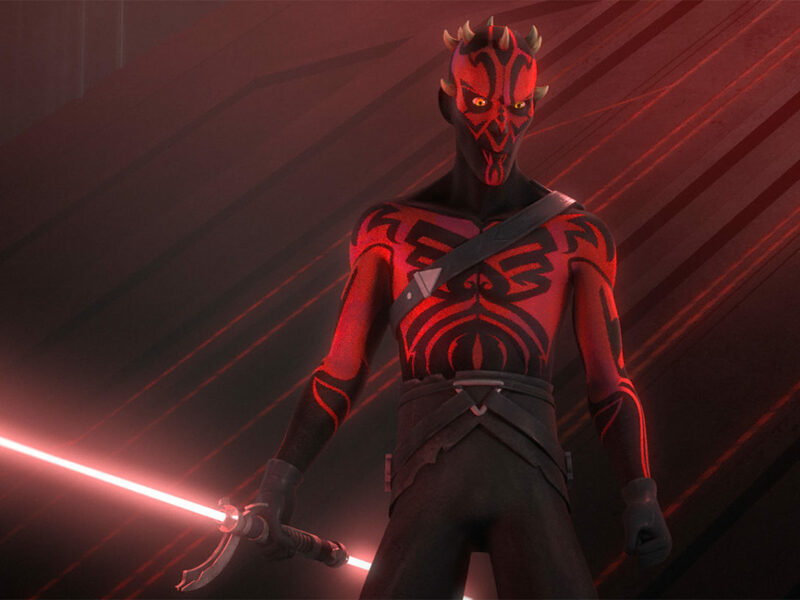 Season Two of Star Wars Rebels was jam packed with amazing moments: Vader lifting smoldering wreckage in “The Siege of Lothal,” Hera flying the Blade Wing in “Wings of the Master,” Darth Maul’s return, meeting a young Leia Organa. 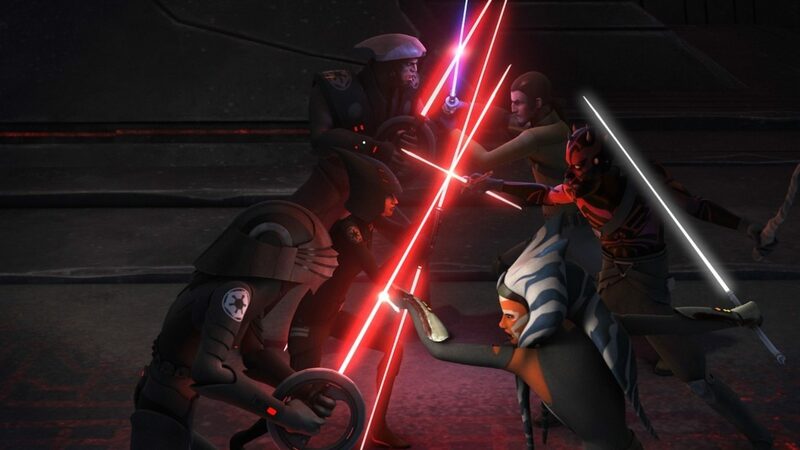 But one moment stands out more than any other — Ahsoka’s battle with her old Master and Lord of the Sith, Darth Vader. Knowing that Anakin was destined to become Darth Vader meant knowing that, at some point, Ahsoka would have to learn the truth. But we always had the question of What Will Happen When She Does? We got our first hint that we’d have an answer when Ahsoka and Kanan reached out with the Force and we heard the words “The apprentice lives.” Some think Ahsoka knew that Sith Lord was Anakin from that moment and lied to Ezra and Kanan, while others believe Ahsoka really didn’t know — or was completely unable to accept the idea. I fall somewhere in the middle, and it’s that undeniable realization that makes their final confrontation so gut wrenching. Would Vader kill Ahsoka? Would Ahsoka find some sliver of good in Vader? Would Snips bring Skyguy to the surface, even for a moment? No one knew until it happened. Whatever she may have thought, whatever Vader had planned for his former apprentice, we weren’t sure. Not until Ahsoka’s saber came down and cracked Vader’s helmet, revealing Anakin’s face and that single Sith red eye. Ahsoka’s pain, her guilt, the death of her hopes — all of it shows in that moment. Whatever she thought she’d see, it certainly wasn’t Anakin Skywalker’s full-blown hatred and vigor with which he resumes the fight. Or his vicious derision of the Jedi Order. Where Ahsoka’s previous statements about no longer being a Jedi ring with regret or sadness, her “I am no Jedi” to Vader as she reignites her white blades is a confirmation that, whatever she may have been or thought she would be, Ahsoka Tano has figured out exactly who she is. Her commitment to Anakin even as he slashes at her. Her determination to be there for him and never leave him again. Her understanding that she’s the only one who can fight this fight and her willingness to keep fighting to help save Ezra and Kanan — all of those actions are pure Ahsoka. We’ll never know exactly what happened once that door closed. And that mystery only adds to the sequence’s power. Do you agree with Meghan or Geek Girl Diva? What do you think was the best moment of Season Two? Let us know in the comments below!